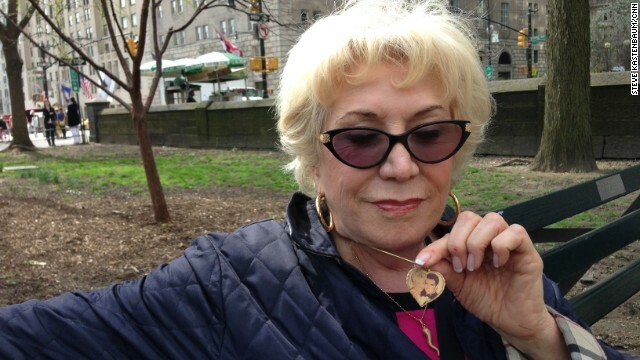 Paulette Hasson wears a photo of her son, Joseph who died on 9/11. (CNN) – It's been over 12 years since more than 2,700 people died at the World Trade Center in New York. The families of about 60 percent of those victims had some human remains returned to them. Often, it was nothing more than a small bone fragment identified through DNA testing. Those still waiting are hoping that a new pile of construction debris will contain the match they still wait for. [2:32] "It'll be difficult. All the emotions, all the thoughts come rushing back to you. It would be a relief to know that these sacred remains are no longer sitting in a landfill somewhere," said Michael Burke who lost his brother, Fire Department Captain William Burke, Jr.
Not all of the family members are anxiously waiting for their phone to ring. [4:44] "I really didn't want to find anything out, anything after a certain point in time because it would only be rehashing things all over again." said Paulette Hasson who lost her son Joseph, an employ of the firm Cantor Fitzgerald. "He's in a good place I'm sure and some day I'll see him and I just feel like this is not something that I want to deal with right now. I don't feel that it will do anything for me if they find a bone fragment." I weep with all those who weep. I sigh and long with all those who sigh and who long. In the Almighty, we are one, I feel you even in comfort, peace, acquiesced. Some of those families may have to brace themselves of the fact their loved ones were completely incinerated when those two jet airliners exploded after crashing into the Twin Towers, so there may be nothing left of their loved ones to find, like alumette says. However, some of the families want a relic because it keeps them linked to their loved ones and helps keep their memory alive. And Jen is right too: No one can tell those families how to grieve their loss because each family is unique and deals with their pain different ways. Some can handle it while others may need help with coping; the latter is where grief counseling and psychotherapy can come in. Hopefully, those families who need such help are getting it. I wouldn't presume to tell anyone how they should heal, or deal with the pain of that day. What ever they need, is their issue. If they don't want to think about it anymore, or if they want a piece of charred bone fragment of their loved one, for whatever reason, let them have it. I do not understand the fixation some people have on organic bits of remains. Their loved ones have vaporized.....been instantly cremated. We can only hope their suffering was short and quick. Most of them knew they were going to die, so their ordeal went on, even without the physical pain. We can all feel their fear, terror in some cases but they are long gone. They have departed this confused world in mass, meaning they were not alone. Their souls are now in various "places" and have moved on. We need to do the same, especially their families. It is easier on them if we let the past go. Paulette Hasson references her son "Joe" in the audio, but the picture caption say "John." Make sure what you're reporting is accurate and consistent CNN.